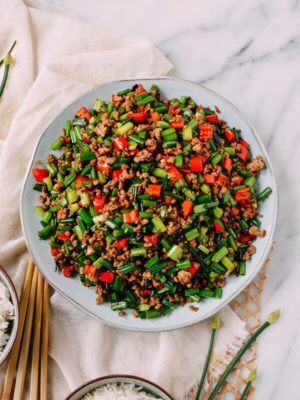 Classic Scallion Ginger Shrimp stir fry is great for the summer and lightning fast to make and prepare. 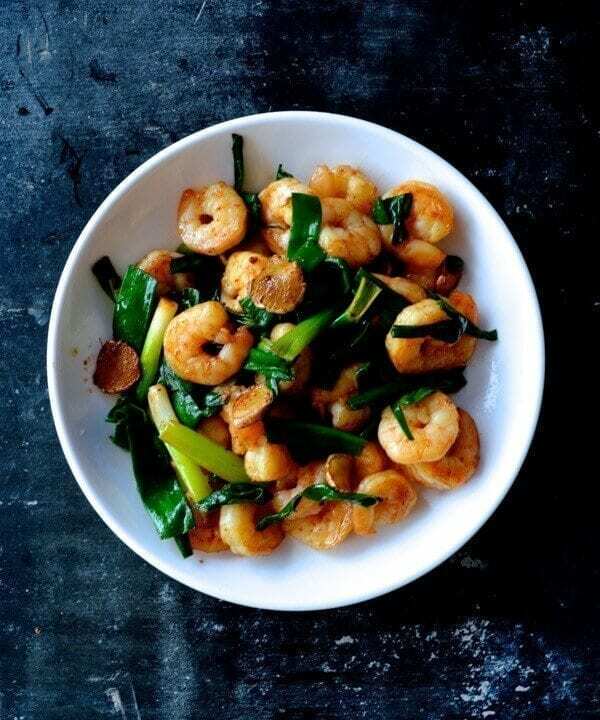 Shrimp defrosts easily, cutting the ginger and scallion is a snap, and and with a hot wok, you could be eating within 10 minutes if you’re skilled in the art of stir-frying! Ok, so if you want to go slowly and not mess up your costly shrimp investment, you can always follow the directions carefully at your own pace. 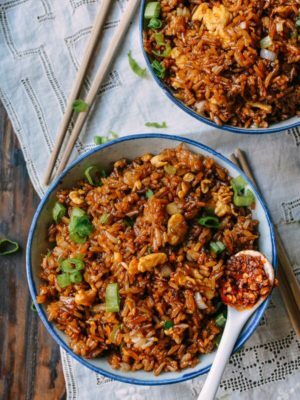 You’ll need time to cook the rice anyway. 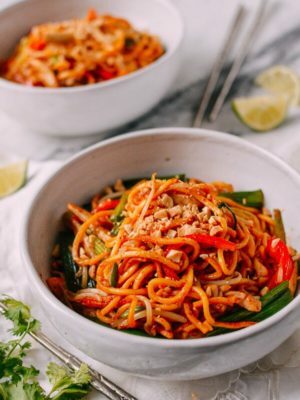 We posted a similar shrimp stir fry recipe way back when we started this blog, but since it’s so quick, we decided to do it again–this time with more photos. 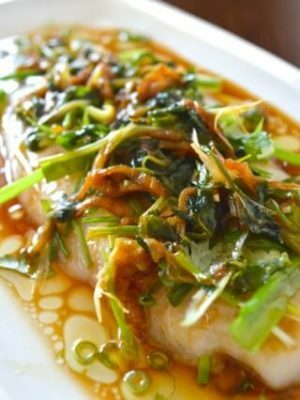 Ginger and scallion are a very common pairing in Chinese cooking and there are many versions of seafood cooked in this style. 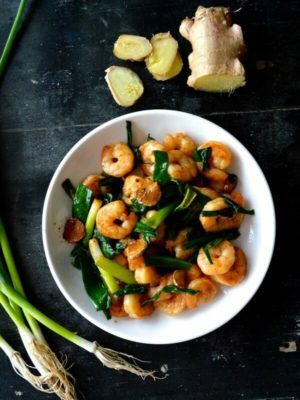 This scallion ginger shrimp stir fry is quite easy to make and it’s much easier to prepare shrimp so it’s a much more approachable dish to cook at home. 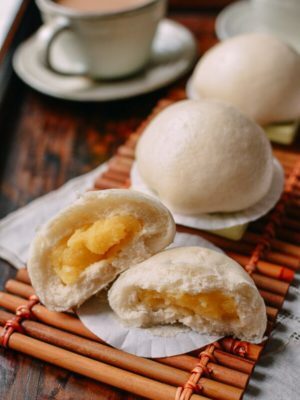 That said, we also have made Scallion Ginger Lobster, twin lobsters just like you get at a Chinese banquet and also Scallion Ginger Cantonese Crab which you must consider for the upcoming blue crab season! Defrost your shrimp and give them a quick rinse, checking them for any veins that still remain. Shrimp right out of of the grocery freezer bags are generally nicely cleaned, but sometimes they do miss a few here and there. 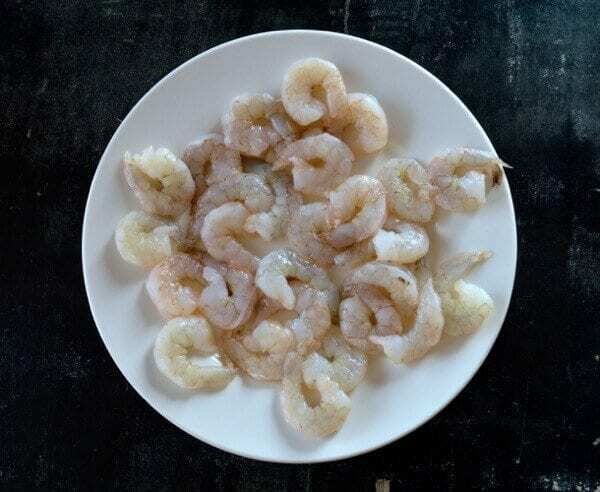 Shrimp defrost pretty quickly and you can always use some warm water to rinse them and move the process along. After they are defrosted and clean, place them into a colander to drain well. 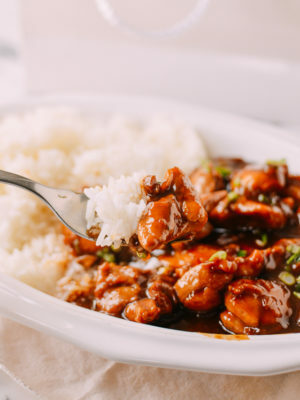 I would recommend you let the shrimp get to room temperature and pat them dry with a paper towel so you don’t get a small flood of liquid in the wok, which will cool it down too much and mess up the dish. High heat is crucial. Next, wash your scallions and ginger and shake them dry. Cut the scallions into 2 1/2 inch pieces and slice the ginger to about 1/8 inch thickness. 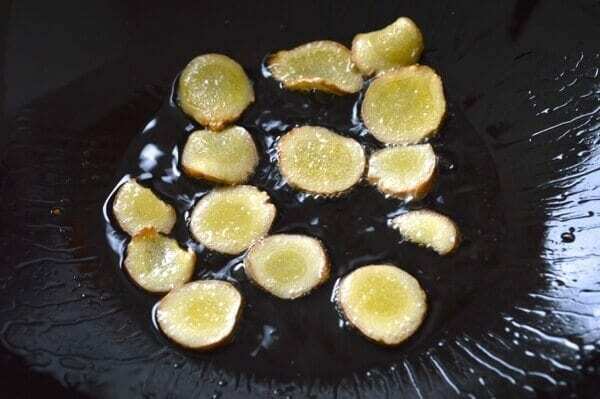 Heat the oil in your wok over medium heat and spread the ginger across the wok. Let it fry in the oil for about 20 seconds to infuse the oil with that great flavor and immediately crank up the flame to the highest setting. We always start with the ginger since it does not burn easily. Next, add the scallion ends and meatier middle parts of the scallion. The wok should hopefully be screaming hot by now. If it’s not screaming hot, a good trick is to remove the stuff from the pan first, really get it smoking, and then add the ingredients back in. 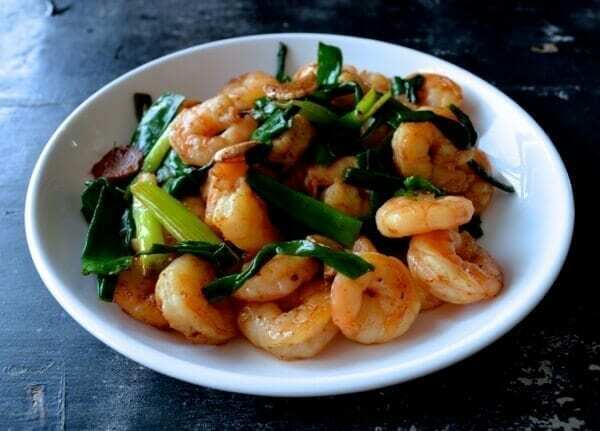 Add the shrimp to the ginger and scallion mixture and give it a quick toss. 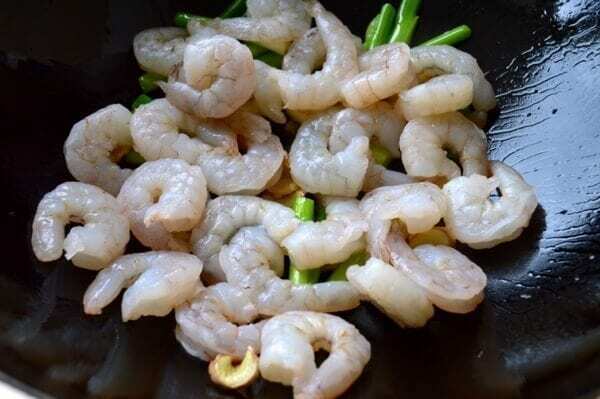 Let the shrimp sear for 20 seconds and add the shaoxing wine, sesame oil, salt, white pepper, and a pinch of sugar. 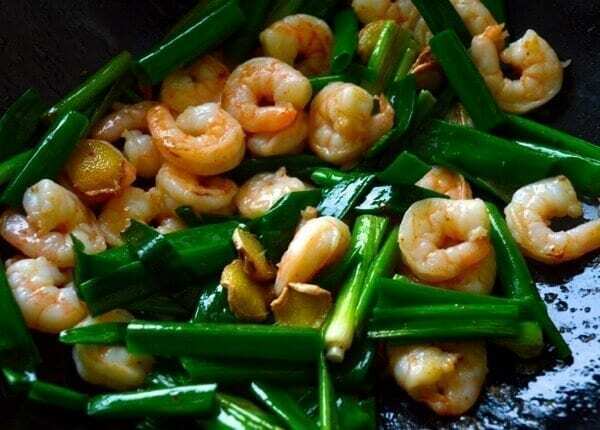 Now add the rest of the scallions to the wok and stir fry until the shrimp is cooked through – about a minute. If you like, now is the time to add that splash of soy. Give it a final toss. 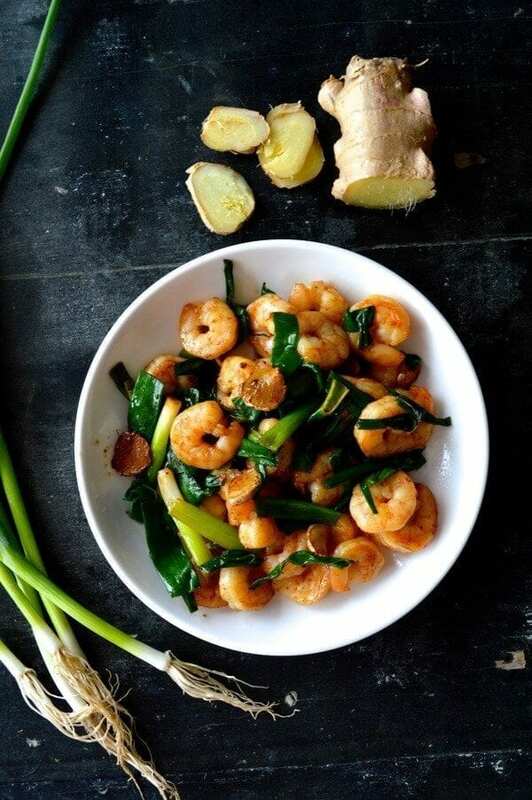 Plate it up and serve this scallion ginger shrimp hot with steamed rice! 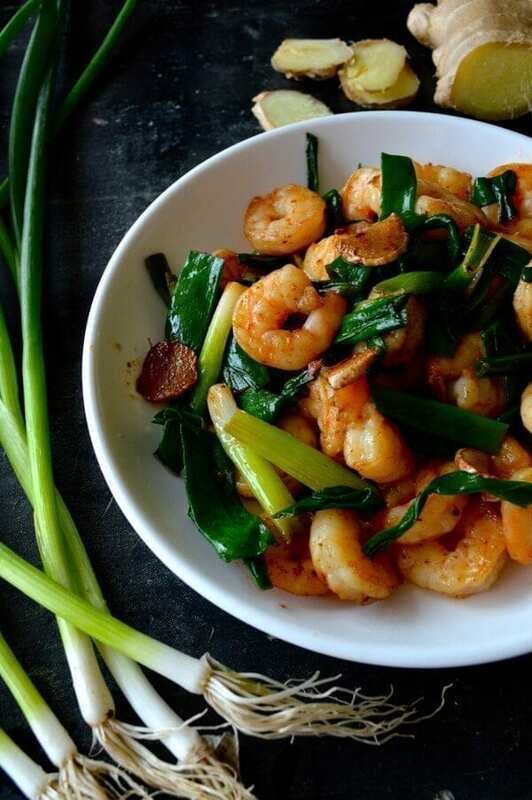 Classic Scallion Ginger Shrimp is great for the summer and lightning fast to make and prepare. 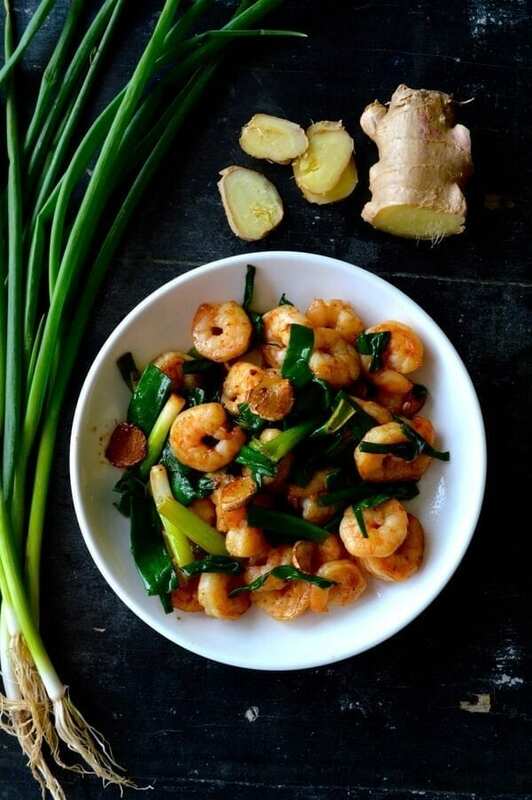 Shrimp defrosts easily, cutting the ginger and scallion is a snap, and and with a hot wok, you could be eating within 10 minutes! Defrost your shrimp and give them a quick rinse, checking them for any veins. After they are defrosted and clean, place them into a colander to drain well. 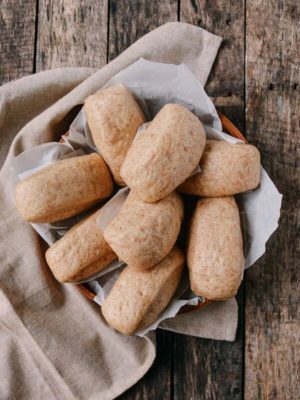 Pat them dry with a paper towel. 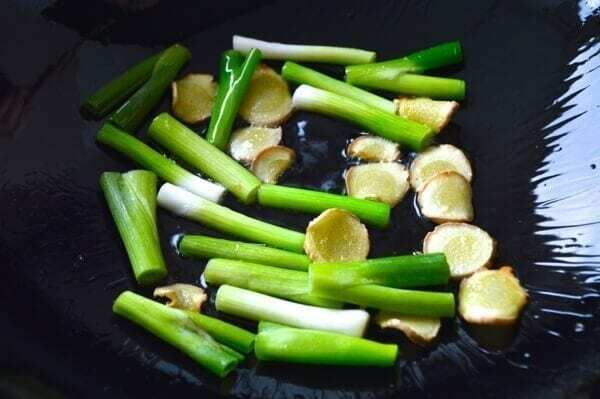 Cut the scallions into 2½ inch pieces and slice the ginger to about ⅛ inch thickness. Heat the oil in your wok over medium heat and spread the ginger across the wok. Let it fry in the oil for about 20 seconds to infuse the oil with all that great flavor, and immediately turn up the flame to the highest setting. Next, add the scallion ends and the meatier middle parts of the scallion. Give everything a quick stir and add the shrimp. Let the shrimp sear for 20 seconds and add the wine, sesame oil, salt, white pepper, and pinch of sugar. I love love love love LOVE this! 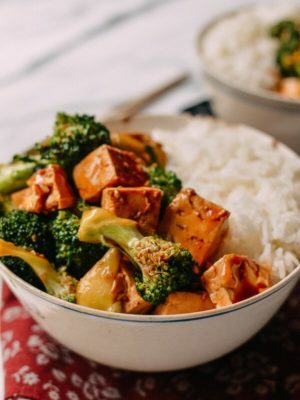 I add some garlic (never tried it without, I am just in the habit of cutting up a few cloves no matter what I’m cooking) and whatever veggies I have on hand (usually broccoli and a julienned carrot but maybe asparagus/mushrooms) and serve with rice. 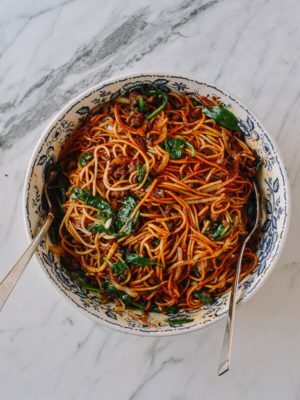 I was wondering however, what is the advantage of using slices vs minced/julienned ginger? Is it to save time, or because it is more authentic, or what? 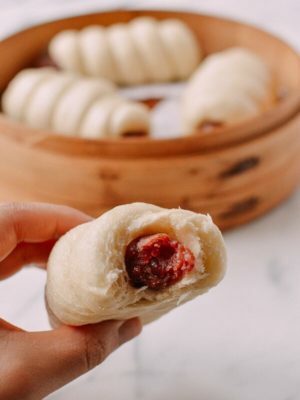 I always end up julienning or mincing it but if I can get the same flavor from slices I would love to save some time! 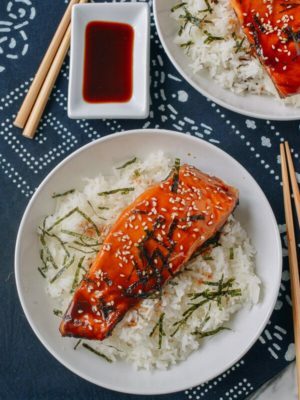 Hi Brandi, we use slices – or even better yet, thick smashed slices to infuse the oil without having smaller minced and julienned pieces dispersed in the dish. It’s definitely a personal preference so keep doing what you’re doing if you like the minced ginger in the dish. Happy cooking! This dish turned out fantastic because of the clear instructions. Having a “screaming hot” wok is the key that brought out the full flavor of of the shrimp. 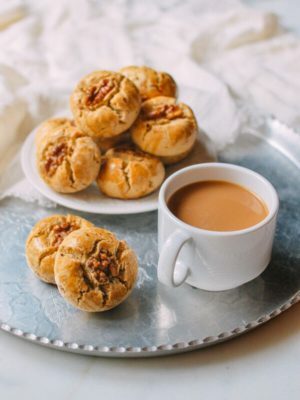 I would never have cranked the heat up so high if not for the recipe. 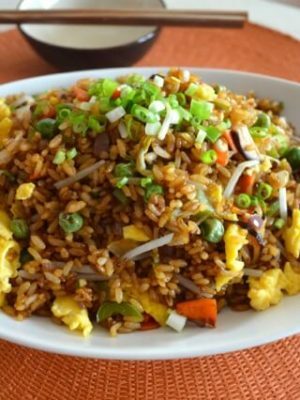 I now know that my home kitchen is capable of creating the wok hei that makes so many Chinese dishes taste good! 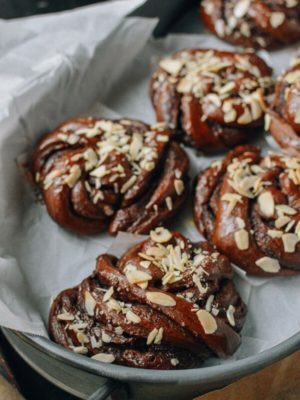 Another wonderful recipe! 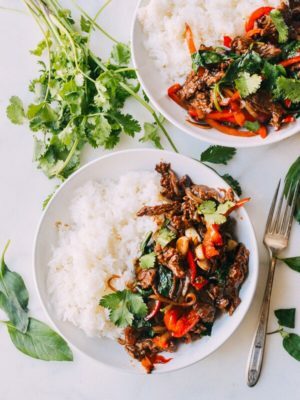 Hi Caroline, gotta love the hot wok for this recipe for generating wok hei. Keep up the great cooking! Couldn’t help but notice, but the ginger seems to have the skin on. Is this the way you recommend to do so? 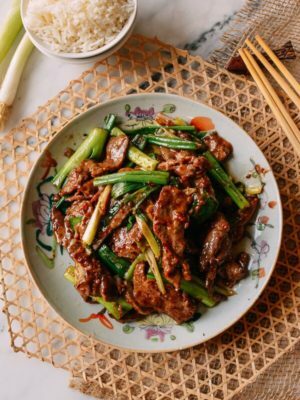 Does one not consume the ginger medallions in this dish?